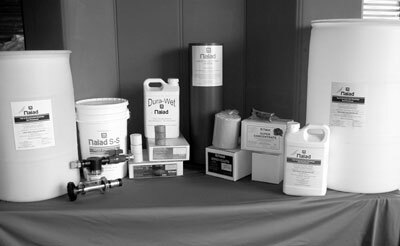 Naiad Company has been manufacturing surfactants since 1978. We make soil penetrants for professional turf and agriculture management. We also manufacture dust and erosion control products for construction sites, agriculture--anywhere dust or erosion creates problems. AND... we now also have a line of soil penetrants for home and garden use! Convenient. Economical. Effective. It's no wonder that Naiad has become the country's largest supplier of wetting agents! NAIAD: the name you can trust! Naiad's uniquely balanced formulation helps water spread quickly and evenly through moisture-resistant soil structures without damage to foliage. Regular use of Naiad can make a noticeable difference in the health and appearance of your turf, ornamental plantings, and crops. 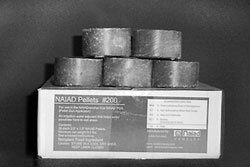 Each Naiad Pellet is about the size of a hockey puck and contains the proper amount of Naiad Wetting Agent to cover about 1 acre. Pellets are designed for use in the Naiadrencher II. Pellets last approximately one hour. Each Naiad Super Pellet is about the size of a five-pound can of coffee and contains the proper amount of Naiad Wetting Agent to cover about 40 acres. 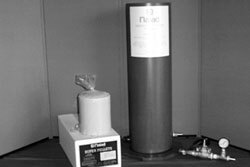 Naiad Super Pellets are designed for use in the Naiad Super-Pellet Tower System. Naiad's granular wetting agent. Concentrate Naiad Liquid mixed on a greens-grade corn cob. One pound covers 1000 sq. ft. Naiad Super Spreadable is colored green to hide in the grass. 30-pound box. 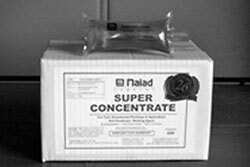 Each tube of Naiad Super Concentrate covers up to 1 acre. Twenty 4-ounce tubes per carton. Naiad Super-Pellet Tower System: The Tower is designed to be installed at the golf course pump station. This system can only be used by turbine type pump systems that pump from a wet well. The tower holds up to 3 Super Pellets. 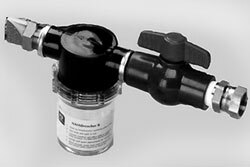 Naiadrencher II Deluxe hose-end applicator: Applicator for the Naiad Pellets. The Naiadrencher II Deluxe comes with the shut-off valve, Buckner fan nozzle, and 1" to 3/4 in-hose adapter. This product also available without the shut-off valve.